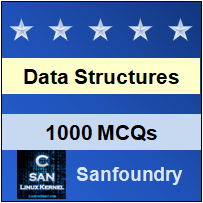 This set of Data Structures & Algorithms Multiple Choice Questions & Answers (MCQs) focuses on “D-ary Heap”. 1. d-heap is similar to that of a? Explanation: A d-heap is similar to that of a binary heap except that binary heaps have two children and d-heaps have d children. 2. d-heap is shallower than a binary heap. Explanation: d-heap is much shallower than a binary heap with respect to performance efficiency of insert and delete operations. 3. Which operation cannot be directly performed in a d-heap? Explanation: Find operation in a d-heap cannot be performed as in other heaps. This is the main weakness of d-heap. 4. Which operation is not efficiently performed in a d-heap? Explanation: Unlike find operation, which cannot be performed in a d-heap, the task of merging two d-heaps is very difficult. 5. What is the run time efficiency of an insertion algorithm in d-heap? Explanation: The run time efficiency of an insertion algorithm in a d-heap is found to be O(logd N) where d is the number of children. 6. How many comparisons will occur while performing a delete-min operation? Explanation: Since, the delete-min operation is more expensive and the heap is shallow, the minimum of d elements can be found using d-1 comparisons. 7. How many basic operations can be performed in a d-heap? Explanation: The two basic operations performed in a d-heap are insert and delete-min operations. 8. What is the run time efficiency of delete-min operation? Explanation: The run time efficiency of a delete-min algorithm using d-1 comparisons is mathematically found to be O(d logd N). Explanation: The given heap is a d-heap since it looks like a binary heap with d- children. Here, d=3. 10. Multiplication and division to find children and parents cannot be implemented in a d-heap. Explanation: Multiplication and division for finding children and parents can be implemented in a d-heap but d should be a power of 2. 11. How many secondary operations are performed in a d-heap? Explanation: The other operations that can be performed in a d-heap are increasekey, decreasekey, buildheap and delete. 12. On which data structure is a d-ary heap based? 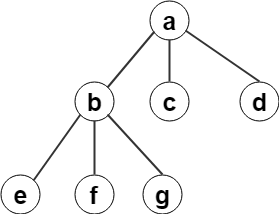 Explanation: d-ary heap is a priority queue based data structure that is a generalization of binary heaps.